The STM32 family counts a new member. 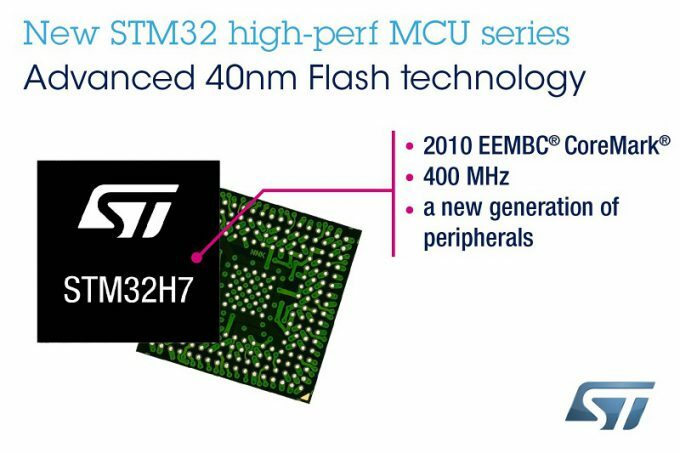 Two years after STMicroelectronics launched their first Cortex-M7 based STM32F7, they announced just recently the launch of the new STM32H7 that promises maximum performance. The microcontroller community is aware of the numerous variations of STM32 offering variable peripherals and various package sizes and forms. Additionally, thanks to a small chip size it can be offered cost-effectively. The STM32 family is a truly success story and has been shipped already more than 2 billion times. The 32-bit Flash microcontrollers based on the ARM® Cortex®‑M7 processor is able to give designers using MCU more creativity in their designing process. Now the STM32 family got another member, which offers the same real-time capabilities, digital signal processing, and low‑power, low‑voltage operation, while maintaining full integration and ease of development. Beyond this STM32H7 delivers double the speed while consuming half the dynamic power of the preceding family. This performance leap has been realized by highly advanced 40nm technology combined to ST Dynamic Efficiency processes. The embedded MCU from ST includes digital circuitry, Flash memory, and analog components. So it has a much more complex structure than typical mainstream components, like SoC in 10nm process node that contain only digital circuits. A three domain architecture is used to optimize the STM32H7. One contains the core with its cache, Flash memory and high bandwidth peripherals. These peripherals are, for instance, responsible to drive a screen or the graphics engine. The second one can be described as the connectivity domain. It groups low-speed peripherals like USB, the cryptographic accelerator and the SD/MMC2 unit for storage. And there is also a domain that is needed for some of the most fundamental aspects of the MCU. The so-called batch acquisition mode domain features MCU reset and clock control as well as the chip’s power management and a basic Direct Memory Access (DMA) controller. What advantages does it bring for the developers? First and foremost traditional constraints will be eliminated by the dramatically increased memory density. 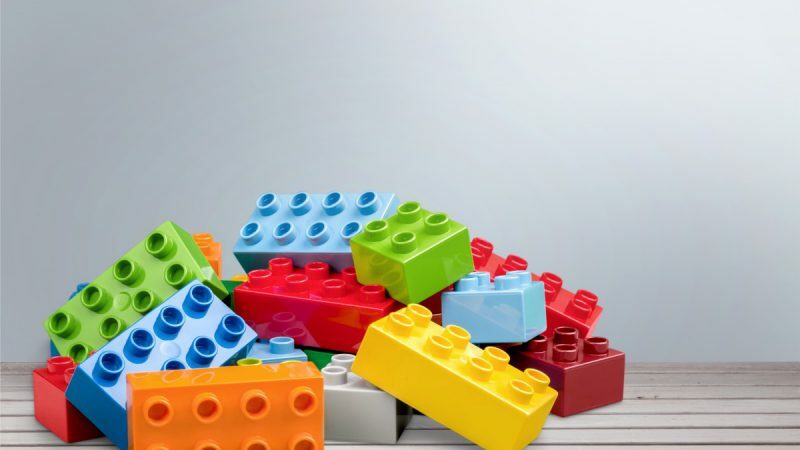 Consequently new products can be put on the market more quickly. On the other hand the STM32H7 is equipped with state-of-the-art security features, which nowadays is a must have when it comes to the Internet of Things (IoT). The above mentioned cryptographic accelerators and a provision of secure-key storage makes it much more difficult for hackers to attack them. 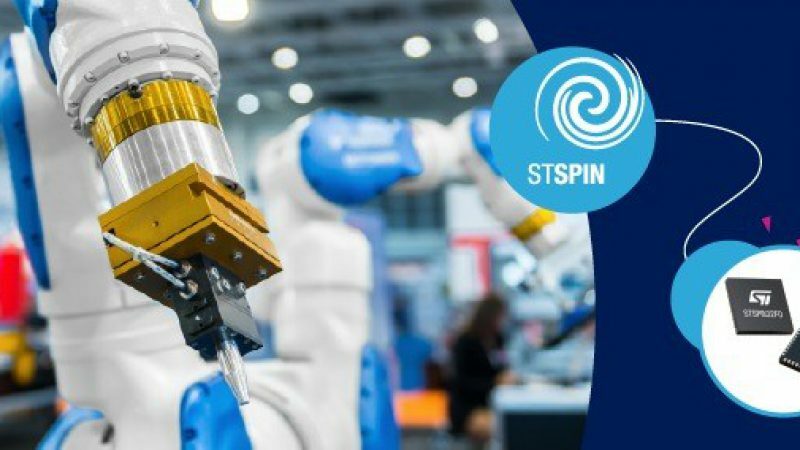 Designed to control and fit with all industrial and consumer applications, and devices using rich user interfaces, the new STM32H7 is the perfect match for the IoT. 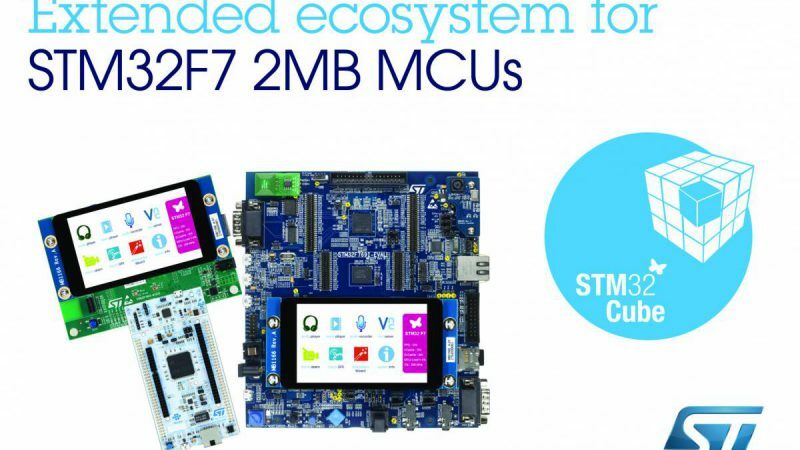 Mass production for the STM32H743 featuring the ARM® Cortex®‑M7 core running at 400MHz, the first device in the new series, will start in the second quarter in 2017. For further information please visit the STMicroelectronics STM32H7 website. For all other questions please don’t hesitate to contact EBV here.